my new sofa arrived yesterday.......yayayyayaay and that gave a whole new meaning to the monday blues!!!! so what do you think?? should i fill it up with cushions?? add a paining on the wall behind?? suggestions please...and do you still think i should have opted for the fab india sofas?? 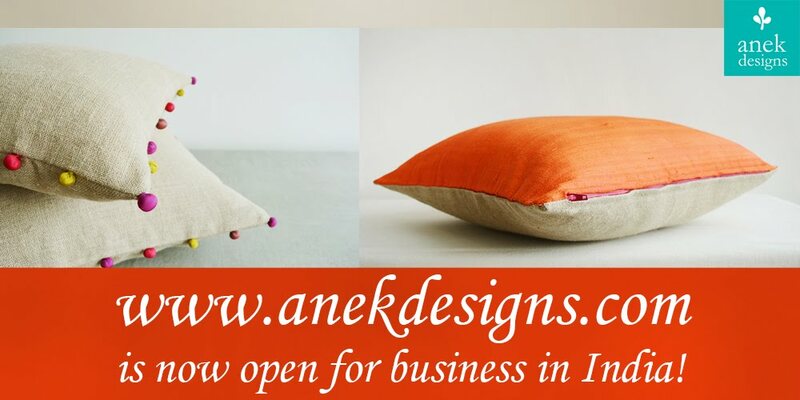 ohh what a gorgeous color Kanika :) and your cushions are absolutely perfect. How about a horizonatl painting or a nice mirror wioth wooden frame, same as your sofa sides ? thanks sulagna!! that was quick! check out ekbote...thats where this sofa is from...ekbote has a showroom in aundh..
Sofa is looking nice. I keep lusting after Fabindia stuff but I think the sofas are a bit too bulky for apartment living. Behind the sofa besides wht Sulagna suggested maybe you could have a wall hanging from Anek !! Lou it! Love the color contrast of the cushions and yes you should add a painting/sculpture/textile art piece to the wall. Love how you got ambitious with the color, it looks great! shweta...i was thinking of a textile piece from anek to go behind the sofa as well!!! poorvi i lou you!!! yes i was a little scared of using such a strong colour on a big mass like this...:) but i am happy it worked out and you like it!! the sofa is very nice.. add more cushions and textile piece is a very gud idea, may be one of your runners.. it will luk cool! Nice sofa. And your gorgeous cushions make a good combo. BTW, how was flea market at Ishanya? No blog post on that eh? did click pics though...will share with you sometime..lets meet soon?? when should i drop by twist and tales?? oh wow.. wow.. wow!! thats my kind of sofa for sure!! i vote for a painting to go with it too! absolutely love the sofa... i like the minimal decor in ur room !!!! Gosh! Love that shade of blue- I like that fact that it isn't the usual Fabindia stuff. Lots of cushions definitely! you can write on that wall - behind the sofa - all in your own hand - and you will remember it all your life.